A bright smile is one of your best features. Not only does it show others that we are confident and friendly, but a broad smile can also be beneficial to your overall mental health, and it’s a shame to miss out on all of that just because you feel self-conscious about your teeth. However, even if we generally take good care of our teeth, it’s easy to stain them through the course of our daily lives. Going out to parties puts you at particular risk of damaging your oral health and the appearance of your teeth, as there are plenty of goodies available for snacking and drinking, and you don’t have access to a toothbrush for hours on end. Some of the food and drinks that you end up consuming during a party can leave nasty stains, and if not taken care of immediately can have some lasting negative effects on your teeth. With this in mind, let’s go through some of the common party foods and drinks that you should limit or avoid altogether. Coffee is one of the most widely used stimulants in the world, with over 140 million bags of coffee being drunk per year across the globe. Saying that it’s a habit that’s hard to kick would be an understatement, but since it leaves very persistent stains, it would be best to avoid it when going out. Plain black coffee is the worst culprit, and if you can’t say no to it, at least try switching to drinking coffee with milk. In a pinch, it helps to rinse your mouth out with water after drinking it. While a lot of people will opt for tea instead of coffee, touting its many health benefits, the truth is that tea can be just as bad as coffee when it comes to leaving stains. A good way to get your tea fix and still keep your teeth relatively white is to drink iced tea, as it is more diluted and contains less polyphenols, the compounds responsible for staining teeth. It’s best to avoid it altogether if you want your smile to stay white while you are talking to people at a party, but drinking from a straw and rinsing with water afterwards should keep your teeth relatively safe. Red wine is one of the finer indulgences in life, and has always been considered a classy drink. However, it does have its drawbacks, and it’s not just the hangover you can get if you indulge a little bit too much. Red wine stains are notoriously difficult to clean, and as the party progresses you’ll drink more of it and forget about your teeth. By the time you get home and brush, the red wine would have been in contact with your teeth for several hours, and a lot of people even forget to brush their teeth when they get home a bit drunk. You should avoid mixing white and red wine, and focus on drinking sparkling water, lightly-coloured alcohols and snacking on cheese to help limit staining. Fruit punch is still a classic party drink, as it is quite tasty and refreshing, but don’t think that your teeth are any safer with this choice of drink. Fruit is naturally fairly acidic, and if you drink a lot of fruit juice or punch it will damage tooth enamel, which makes your teeth more susceptible to stains. It’s also very high in sugars, which will allow the bad bacteria in your mouth to thrive. Drinking some punch and then switching to wine is a particularly bad combination. Soft drinks with a darker hue are incredibly effective at staining your teeth. They combine the acidity of fruit drinks with the strong colour of red wine. This means that if you drink enough, they will erode your enamel, causing the strong artificial colours to take hold and paint your teeth yellow. Using a straw will help to an extent, and so will drinking some plain or carbonated water afterwards, but if you are really counting on that big white smile, it’s best to go with a light-coloured drink. Try to avoid energy drinks as well, as they tend to be just as acidic, and have strong artificial colours, usually red, orange and green. Chocolate is always a welcome addition to any party, and will convince your guests of your charming hosting skills. It is also considered to be a good aphrodisiac. 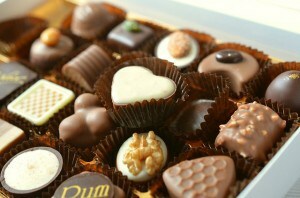 That being said, chocolate can harm your oral health in more ways than one. Even if we ignore the fact that there is a huge amount of sugar in the average chocolate bar, and that it tends to readily stick to teeth, there is still the issue of staining. Dark chocolate contains theobromine, which helps strengthen the enamel, and has less sugar, so it is a safer option. You can also skip the sweets and go straight for appetizers like cheese, which lowers the pH value in the mouth and helps protect your teeth. You may opt for some kind of fruit-based dessert, in order to avoid eating too much chocolate and risk staining your teeth, but it might not be such a good idea after all. Desserts such as pies that contain darker berries – e.g. blueberry, cranberry, and blackberry – will cause some serious stains. Just like red wine, dark berries have really powerful pigments, and it only takes a few bites to darken your teeth. Pies in particular are a bad choice, as they combine starchy carbs, which tend to really stick to your teeth, and berries that have high acidity and potent pigments. A good alternative are fruits like apples and strawberries, as well as nuts, as these foods actually benefit your oral health. Keeping your teeth white for a long time is all about maintaining good oral hygiene and brushing and flossing after every large meal, but you’ll also need to be a bit more careful when eating and drinking at parties. As with most things, anything is acceptable in moderation, even when it concerns your oral health. As long as you avoid the foods and drinks mentioned above, or at least go for less harmful options, you will keep your smile beautiful and white. Want faster and better whitening results? Book an appointment with us today to whiten your teeth instantly! Teeth Whitening: In the Clinic or Over the Counter? There's a clear difference between whitening products purchased over the counter and a professional whitening treatment. Today, you can choose between sleek, modern braces and near-invisible Invisalign.